The Stoneham Historical Commission and the Stoneham Historical Society jointly sponsored a public informational meeting recently at the Historical Society Museum to commemorate Preservation Month. The topic was entitled "Community Preservation Act (CPA) - Yes or No for Stoneham". The special guest speaker was Christopher Saccardi an expert on the CPA who works with the Community Preservation Coalition, a coalition of housing, historic preservation, and open space non-profits that supports communities in their efforts to better understand and possibly adopt and implement the CPA. 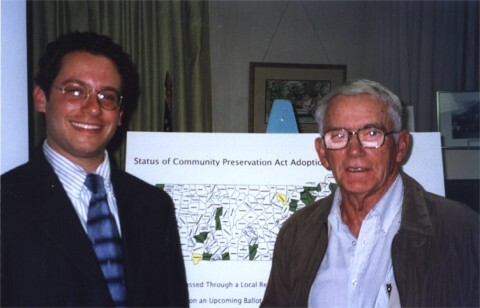 Christopher Saccardi (left) and local resident, Historical Society Member and former State Rep. Dan Towse (right) standing in front of the map of MA indicating the communities that have thus far adopted the CPA. Source: Bee Russo, President, Stoneham Historical Society, July, 2002.